A musician, singer, songwriter, author, computer programmer, database administrator, webmaster, website host, minister, dreamer, student & teacher just to list a few of his activities, Thor Hammaraxx resides in Melbourne Australia. Interested in many things, Thor searched high and low for the answers to questions that had puzzled him for over a decade. Questions that came about from discovering contradictions or gaps in current theories and accepted “truths”. Unable to find the answers elsewhere, Thor worked on answering the questions himself. Entering into far out possibilities as exercises in lateral thinking then applying principals of ‘Occam’s Razor’ Thor stumbled on the answer to his greatest challenge. How can the precession of the stars occur without the Earth’s axis having to wobble? 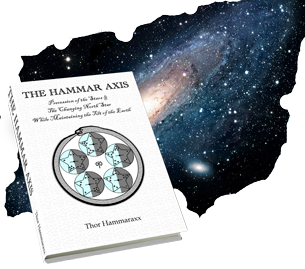 in 2010, on discovering the actual cause of the precession of the stars and not being able to find a similar idea anywhere else, Thor quickly published his discovery in his third book, The Hammar Axis, in order to share his idea with the world. OS 012 is both a playful and a descriptive title signifying a recent phenomenon that is spreading worldwide via the internet. This phenomenon has now spread to you via this introduction to the book, and now you are a link in a network that spans all over the world. OS 012 is often quite tricky and elusive to understand at first. OS 012 has a logical system that can be taught, but its intuitive side must be caught. The letters O & S contain more than one meaning. 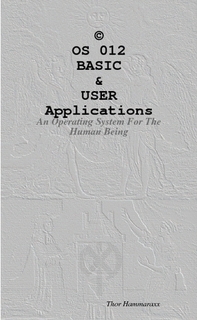 In the playful sense, OS stands for Operating System, as in an Operating System for Human Being, merely referencing the ironic twist between binary code for computers (0/1) and a natural ‘trinary’ code of perception for complex and novel human being (0/1/2). O & S can also signify Objective and Subjective, as OS 012 references the play between object and subject, or the perceived and the perceiver. In June 2003, unaware of a hidden one year old Australian law, Shayman and friends discovered Salvia Divinorum and began to explore its wonders. So impressed with what they found, and believing Salvia Divinorum was unregulated, they decided to create a website to report their experiences. On the 18th of August 2003, the first version of the website was placed online. It featured only a few pages about, Salvia Divinorum, Salvia Crusaders members, pictures and photos, as well as a couple of trip reports. Researching the Internet for information, Shayman discovered that Australia banned Salvia Divinorum a year earlier. Researching the banning process it became clear that there was a need to bring honesty and rationality back into Australian Law, and return the freedom to Australians to use Salvia Divinorum in peace. 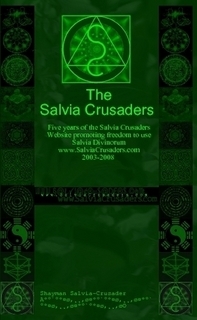 This book archives the documents from the Salvia Crusaders Website 2003 to 2008 as it was hosted on the Geocities servers & www.SalviaCrusaders.com. Published under the name “Shayman Salvia-Crusader”.